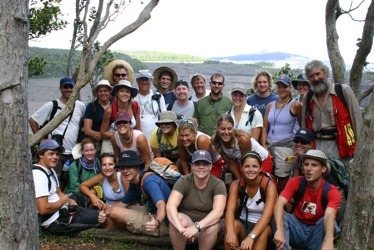 Welcome to the home page for the Hawaiian Volcanoes Field Course 2004 organized by a group of volcanologists and petrologists from the University of California campus in Davis and San Diego. On this website you can find practical information about the field trip itself, which courses are prerequisite, what to bring to Hawaii, where to register, etc. This site will be maintained to also report the findings of the participants in the form of daily reports and image galleries, and many other data products. Hawaii Volcanoes National Park, Hawaii. Participants will learn the fundamental aspects of physical and chemical volcanology. This course has a major field study component and subjects which are introduced in lectures will be reinforced and expanded upon through exercises in the field. Field work may involve hiking as much as 15 miles per day and participants must be able to keep up with the rest of the group. For more course info see the Links panel on the right hand side. Morning lecture/discussions and afternoon field exercises. Evenings generally free, but an all day trip or special function may be scheduled for Saturday. There will only be one full day off during the two week program. Field trips are mandatory. Participants will stay at the Kilauea Military Camp located at the north edge of Kilauea crater in Hawaii National Park. Today was an eventful day, where we studied an extensional fissure through the Keanakakoi Ash, Halema'uma'u crater and the Kilauea Caldera Floor. Also we performed pH soil measurements and we measured the ejecta sizes from the 1924 Halema'uma'u eruption. In our 2nd day we studied two USGS drill holes in lava lake of Kilauea Iki crater. We rounded off the day by visiting the Pu'u Pu'I cinder or spatter cone and the Thurston (Nahuku) lava tube. Pele's Tears could be found by digging around in the volcanoclastic deposits. And today we witnessed dripping lava flows and tons of good examples of 'A'a and Pahoehoe flows.